Milwaukee Tools continues to innovate and expand its M18 and M12 lines of Milwaukee cordless tools which now include the M18 FUEL and M12 FUEL lines. In 2005, Milwaukee Tools was the first tool manufacturer to introduce Lithium-Ion battery technology to the power tool industry with the Milwaukee V28 cordless tools and has since continue to be a leader in the cordless tool market. The mantra that Milwaukee Tools has lived by is "nothing but heavy duty", and this mantra is incorporated in every cordless product that they introduce or improve on the market. Milwaukee Tools is dedicated to delivering a steady stream of advanced solutions for the trades, solutions that offer increased productivity and unmatched durability. If you are looking to cut the cord, look nowhere else but Milwaukee M18 and M12 cordless tools. 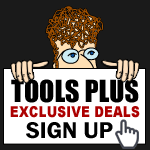 Tools Plus offers a wide selection of Milwaukee cordless tools and is your one stop shop for everything Milwaukee Tools.